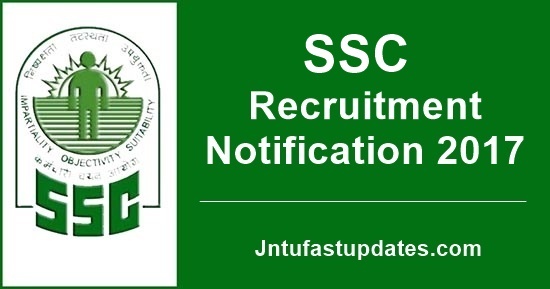 SSC Recruitment 2017 Scientific Assistant Notification for 1102 jobs in Met Department: The Staff Selection Commission (SSC) on Tuesday issued a notification for recruitment of Scientific Assistant In India Meteorological Department. The commission will fill 1,102 (tentative vacancy) posts through this process. The examination (computer based) will be held from November 20 to November 27, 2017. The last date for receipt of application August 4. Staff Selection Commission will conduct a open competitive examination for recruitment to the post of Scientific Assistant in India Meteorological Department, Group „B‟ Non-Gazetted, Non-Ministerial post, in the Level 6 of the Pay Matrix (Pay Band2(Rs.9300-34800) plus Grade Pay Rs.4200 in pre-revised scale),from 20.11.2017 to 27.11.2017 in computer based mode all over the country. NOTE-I: The qualifying Degree or diploma referred above should be in First Class (60% marks) or 6.75 CGPA on a 10 point scale. NOTE-II: The qualifying Degree or Diploma referred above must be of three (3) years duration after (10+2) examination. NOTE-III: The applicant must have passed 10+2 Examination from a Recognized Board or equivalent in Science with Physics and Mathematics as core subjects. Candidate may note that only online applications will be accepted at www.ssconline.nic.in. All women candidates and candidates belonging to Scheduled Caste, Scheduled Tribe and Physically Handicapped categories are exempted from paying application fee, as per extant government orders. Fees can be paid through SBI challan/ SBI Net banking or through credit/debit cards of any bank. Fee once paid will not be refunded under any circumstance. HOW TO APPLY: The application must be submitted through online mode only. For detailed instructions for filling up the application form, Annexure-I may be referred to. 2. The Commission has devised a simplified format for the online application procedure. In the process candidates may register once and may apply for any examination conducted by SSC. 3. One-time registration is the permanent database of candidates. The Registration ID and password provided by the system should be noted by the candidate and kept safely so that it can be used for applying to any examination conducted by SSC. The registration facility is available to the candidates throughout the year on website http://ssconline.nic.in. The registered candidates may log into the system and can proceed for application filling. The facility of online application (including payment of fees through SBI net banking/ Credit or debit cards of any banks) will be available from 18-07-2017 to 04.08.2017 (up to 5.00 PM). However, candidates who wish to make the payment through challan of SBI, may make the payment to designated branches of SBI within the working hours of bank upto 08.08.2017 provided the challan has been generated by them before 5.00 PM on 04.08.2017. 4. The online submission of the application may be made at website http://ssconline.nic.in. Candidate should read the instructions in this Notice carefully before making any entry. Candidate should provide all the required details while filling up the online form. Mandatory fields are marked with * (asterisk) sign. The filling of online application contains two parts: Registration Part (In case not registered earlier) and Application Part. 5. In Registration Part, candidates will have to provide their basic information and upload their photograph (in JPG format, having digital size between 4 KB and 20 KB) and signature (in JPG format, having digital size between 1 KB and 12 KB). On submission of these details, candidates shall be prompted to check the details and make any correction in the registration. 6. In case, there is any discrepancy in „one-time registration‟ data filled by the candidate, photograph / signature etc, „one-time registration‟ data may be suitably edited before proceeding to fill online application form. The Commission allows editing of information like name, father‟s name, mother‟s name, date of birth, gender and matriculation roll number only once after registration. Therefore, these fields MUST BE ENTERED / EDITED VERY CAREFULLY. Other fields in the „one-time registration‟ can be edited once before every exam but prior to submission of application for examination. SUCH EDITING IS ALLOWED BEFORE SUBMISSION OF APPLICATION. ONCE THE APPLICATION HAS BEEN SUBMITTED, NO CHANGE IN „One-time Registration‟ and Application data will be allowed. 7. Then a candidate can proceed to fill online application with Registration ID and password provided in the one-time registration process. The application procedure is incomplete without application part. Application part requires filling of information about choice of centres, education qualification, making payment of examination fee, etc. 8. To pay fee in cash, candidates should take print-out of the challan generated online after completion of Application Part and deposit the requisite fee in designated branch of State Bank of India within the stipulated date and time. 9. Request for change/ correction in any particulars in the Application Form shall not be entertained under any circumstances. The Staff Selection Commission will not be responsible for any consequences arising out of non acceptance of any correction/ addition/ deletion in any particular filled in application form whatever the reasons may be. 10. The application form without photograph/ signature or with blurred photograph/ signature or incomplete in any manner will be rejected summarily. Candidates can check eligibility, application process, syllabus, examination centres’ list and other details on the official website of SSC. So can i eligible for this application? In tier 2 all subject are compulsory , either depends on the applying post. Please provide me suggestion sir.